All About Water guided kayak tours along Sleeping Bear Dunes National Lakeshore start in either Empire or Glen Arbor. The total time for one is about four hours, and for the other about five hours. Total time on the water approaches three hours, and four hours respectively. Candidly, you can see many of the things featured on the tours without going on the trip. For example, the dune at the scenic overlook is visible from the public beach in Empire about four miles south. Or, you could descend from the public overlook on the Pierce Stocking scenic drive or from Pyramid Point and view either from the bottom just like our guests. Unlike our guests though, you would then have to climb back up the 450′ dune at Pierce Stocking or the 260′ dune at Pyramid Point – arduous tasks, indeed, that may take hours. North Bar Lake is accessible to the public and you could go there on your own, too. So why take one of our trips? Because approaching the dunes, arguably the most prominent features in all of Sleeping Bear Dunes National Lakeshore, from the water in the peace of a kayak is truly unique. You can relax and know that the guides have been trained to provide a safe, enjoyable kayaking experience. The kayaks and all of the equipment are maintained for safety and comfort on the trips. The kayaks, seat backs, and paddles will be at the water waiting for you. The life jackets will be provided in the parking lot. 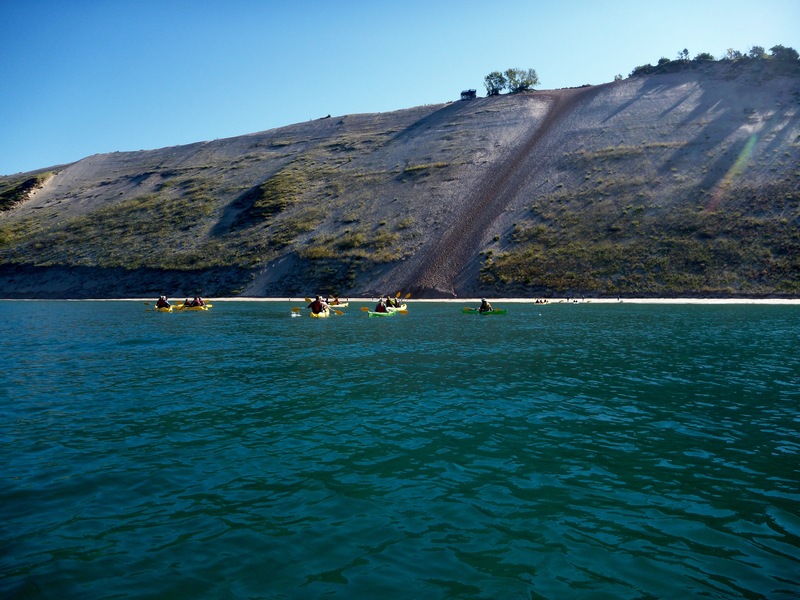 All you have to do is paddle and enjoy the beauty that is Sleeping Bear Dunes National Lakeshore. We believe a kayak provides a unique perspective to see this grandeur. Our primary concern will always be the safety of our guests and guides. So, on those days when the conditions on Lake Michigan are just not conducive to kayaking because of current or forecast weather, we will offer alternatives. The first option will be a rain check to make the guided kayak trip another day. Another option will be use of All About Water kayaks and equipment on that day on an inland body of water – Crystal River, Victoria Creek, or School Lake. If necessary, a 95% (ninety-five percent) refund will be provided. We will provide the kayaks, paddles, seat backs, dry bags for personal items, and life jackets for all. You just need to bring water, suntan lotion, snacks (high energy snacks are recommended), and plenty of enthusiasm. Please wear synthetic materials rather than cotton. 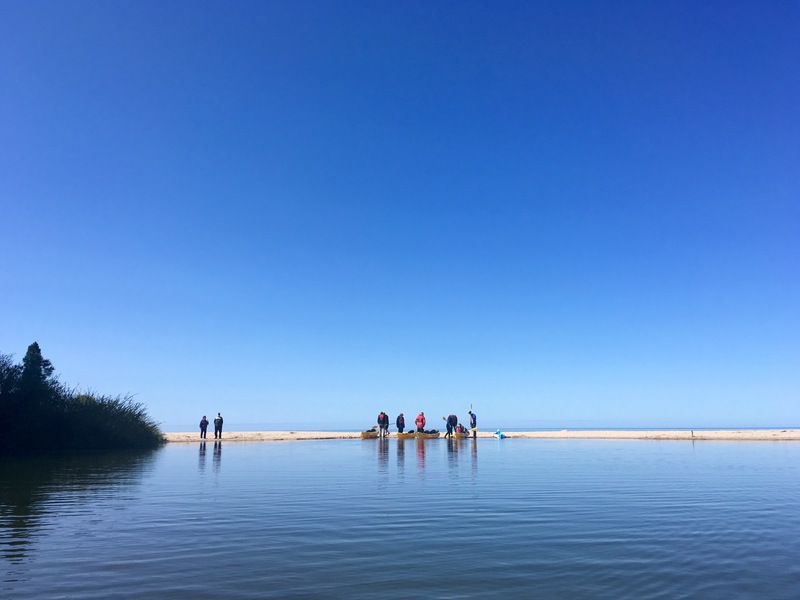 The authorization we received from the National Park Service to provide guided kayak tours includes a number of conditions: the safety of our guests and guides, and respect for nature are primary themes of these conditions. All of our plans flow from those themes. The 450′ high dune at Pierce Stocking Scenic Overlook. See the viewing platform at the top to the left of the two clumps of trees? Our kayak guides have all been trained by instructors with credentials through the ACA (American Canoe Association, www.AmericanCanoe.org). The instructors will have put together an instruction program specifically designed for our guided kayak tours in northern Lake Michigan. Prior experience in a kayak is not necessary to enjoy our guided kayak trip to the base of the Pierce Stocking Scenic Overlook. However, we recommend some experience for the trip to Pyramid Point. We both cases we can provide you with instruction on what you need to know to have a safe, enjoyable kayaking trip. 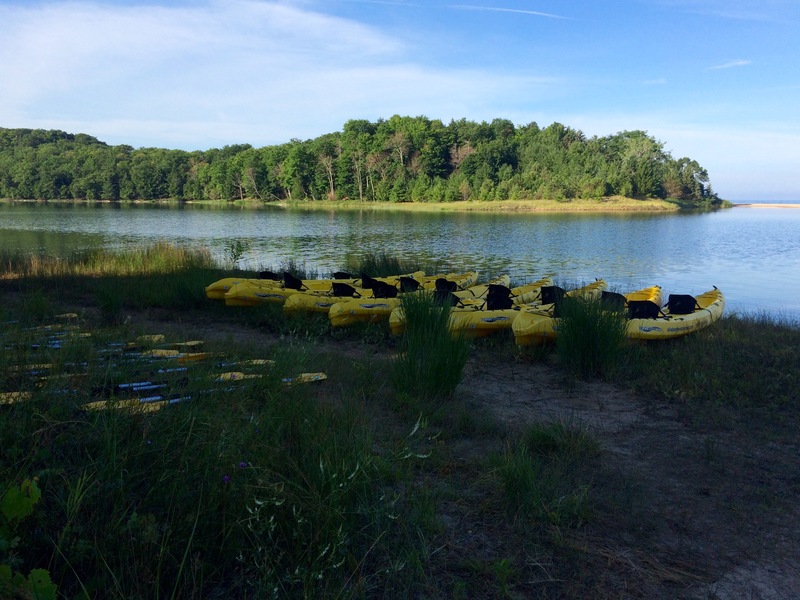 Moderate physical fitness is required to required to participate in the guided kayak tours. All About Water is not aware of reasonable objective criteria to determine who is capable of making the kayaking trip, and who is not. It is simply up to the individual to make the appropriate decision. We have put together our guided kayak tours with planned rest stops, but the outing will require some minimal physical strength and stamina. This is not meant to deter those who do not exercise regularly, but just to help remind people that this will not be like floating the lazy river at Disney World. Expect to paddle at a leisurely pace that will be comparable to that of walking. Reservations for children as young as 14 are accepted, but we must speak with you before accepting any reservations for children under 14. We provide sit-on-top kayaks so there is no issue of whether someone will fit into a small kayak cockpit. Our maximum capacity is over 300 pounds for an individual, and over 600 pounds for two passengers. The summer at Sleeping Bear Dunes National Lakeshore is short and subject to a wide variety of weather. Our guided kayak trips will proceed even with less than ideal conditions. Fog, rain, and cool temperatures will not lead to cancellations. However, high winds and waves, and lightening will keep us off the water. The weather can change quickly, so we may try to wait out a storm to preserve the day. Alternatively, a trip could be canceled because of a threatening weather forecast even though the current weather may appear perfect. We will always use the latest technology to make the best, safest decision. On those days when the conditions on Lake Michigan are just not conducive to kayaking because of current or forecast weather, we will offer alternatives. Please keep in mind that the weather can vary greatly from the shores of Lake Michigan to inland communities. The weather may be excellent at one location, and bad at another. Please do not assume that because the weather is bad where you are, the weather is also bad at the trip location. You should proceed to the gathering place regardless of your local weather, unless we notify you otherwise. There is no deposit. Reservations are paid in full in advance. Packages purchased through promotions or special events have the opportunity to schedule the date of the reservation later. Reservations purchased without a promotional event may schedule the date of the reservation at the time of purchase or later. 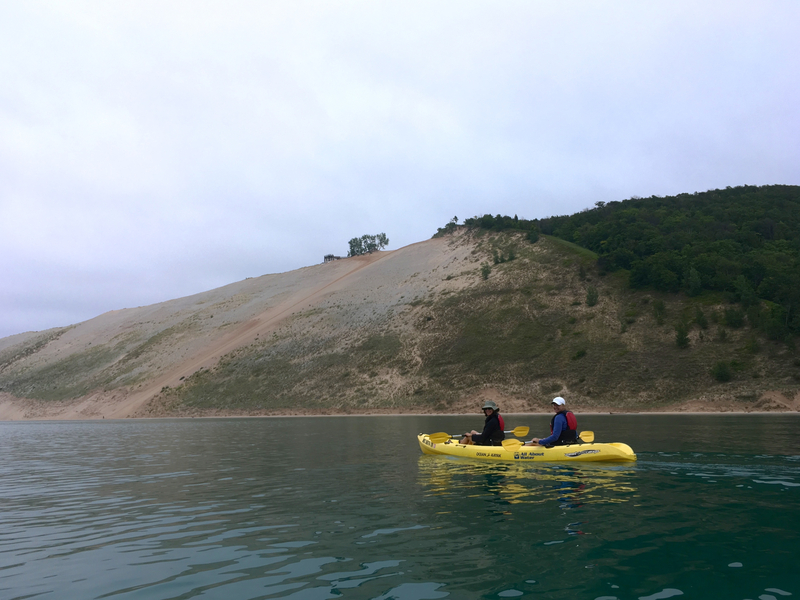 Please keep in mind that you will need a National Park entrance pass to enter Sleeping Bear Dunes National Lakeshore. An actual conversation or exchange of confirming emails with All About Water will be required for a cancellation. The trips start at two different locations. Our original trip starts in the parking area at Village Park, Empire, Michigan. Our new trip to Pyramid Point starts at our parking lot in Glen Arbor. Please be sure to the check the location and start time in the details of the trip you choose. How long do the guided kayak tours last? This is an obvious question, but one that is nevertheless difficult to answer. Our expectation is that the average trip to the Pierce Stocking dune will be on the water close to two and a half hours, including rest stops. The trip to Pyramid Point will probably be on the water over four hours. These times will vary depending on the wind and waves, and the speed of the group. Naturally, some groups will simply progress faster than others. Please keep in mind that these guided kayak trips are based on specific distances, not times. We had a recent trip that was over an hour paddling into the wind, and fifteen minutes on the return trip paddling with the wind. Our objective will be to get in the kayaks and on the water as quickly and efficiently as possible. One-person kayaks or two-person kayaks? We provide two-person kayaks unless there is a special situation. If you have a private group of twelve we can be sure to assign you all to the same guide. Our authorization from the National Park Service allows up to twelve guests per guide. If you have fewer than twelve in your group we will do our best to get you all with the same guide. You will take out of Sleeping Bear Dunes National Lakeshore anything you bring into Sleeping Bear Dunes National Lakeshore. Calls of nature — You should expect that you will NOT have access to any toilet facilities from start to finish. (There are outhouses at some of the starting and ending locations, but you should not assume that we will depart from those locations.) Our National Park Service authorization requires that anyone who needs to defecate shall do so in a product that is essentially a portable outhouse – really just a plastic bag. We will have a supply with each group. You would take the used portable outhouse product with you from the park and dispose of it in an appropriate receptacle. Sleeping Bear Dunes National Lakeshore is a unique geologic area. Many consider the extensive dunes beautiful and perhaps even spiritual. Others simply do not understand the attraction. All About Water knows that the shoreline and scenery will not appeal to everyone. For example, much of the shoreline along the area by Pierce Stocking Scenic Overlook is simply sand dunes that rise hundreds of feet from the water with little vegetation. We want everyone to have reasonable expectations before they make reservations. If you are not familiar with the shoreline, seek out images on the Internet. In short, do your homework so that you have an idea of what you can expect. We have read through online reviews for such spectacular places as Yosemite, Grand Canyon, and other objectively beautiful places. Some of the negative reviews there, and comments about what people expected, are mind-boggling. We want you to avoid the types of disappointment experienced by some of those uninformed tourists. You should understand that the name of the park, Sleeping Bear Dunes, is not based on bears seen sleeping there. The name comes from a Native American legend. Although there are reports of bears within the park, it is most unlikely that you will see any bears. Many areas along the trip provide little vegetation for the animals to hide, so you probably won’t even see any wildlife on the tour other than birds.